Wing Play: Getting in Behind the Fullback! Attacking in the final 1/4 of the field is vital to being a successful team. One area which is overlooked by many coaches is the art of wide players in a 4-4-2 or wingers in a 4-3-3 who need to be addressed in how to get in behind the defending Fullback. Teaching the winger to recognize how to get into the space behind the FB with &apos;0&apos; touches or &apos;1&apos; touch&apos; will encourage not only another way to attack but also to create opportunities to deliver the ball from wide areas when the team can not attack behind the defensive line or through the central areas of the field. Wing Play: Getting Behind the FB. View Point of the Goalkeeper. 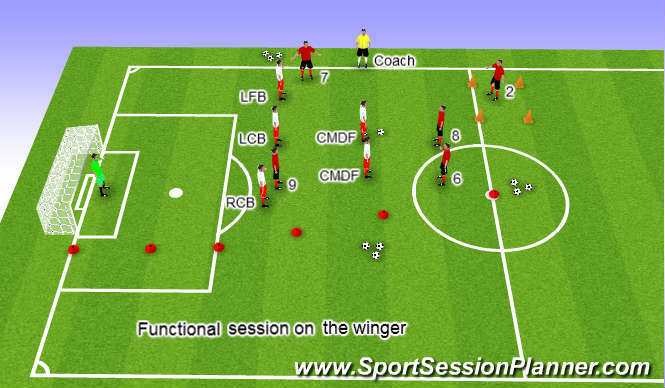 A Fuctional Training Session which focuses on a particular part of the field. Half field which is reduced in width to the area highlighted inside the red cones. Red who are attacking the goal score on the big goal. White who are defending play into the area outlined by the orange cones. Play a pass in, support it and get it back and pass it in again to score a goal. Advance play: Player &apos;2&apos; will be attacking to combne with Player &apos;7&apos; then the defending must dribble the ball into the open area to score. It is important to make sure the defensive team shape is correct based on where the ball is! Therefore have the line push up and stay in contact with their midfield. Player &apos;B&apos; plays a pass to Player &apos;8&apos; and pressures the ball to attempt to recover possession. Player &apos;8&apos; takes his/her first touch away from pressure to play forward if possible. (if the defensive players in midfield open up, encourage Player &apos;8&apos; to play forward to Player &apos;9&apos; or dribble between the midfield defense or apply any other option available). After losing possession the defensive MDF should be enouraged to apply pressure to on the ball to prevent play through the central areas of the field. Some Pressure on the ball then: then hold their position and receive the ball at their feet. (can s/he get past on first touch (inside/outside of FB) or combine with Player &apos;8&apos;, Player &apos;9&apos; or Player &apos;2&apos;. Some Pressure on the ball then: Player &apos;7&apos; holds his/her position and receives the ball at his/her feet. (can s/he get past on first touch (inside/outside of FB) or combine with Player &apos;8&apos;, Player &apos;9&apos; or Player &apos;2&apos;). 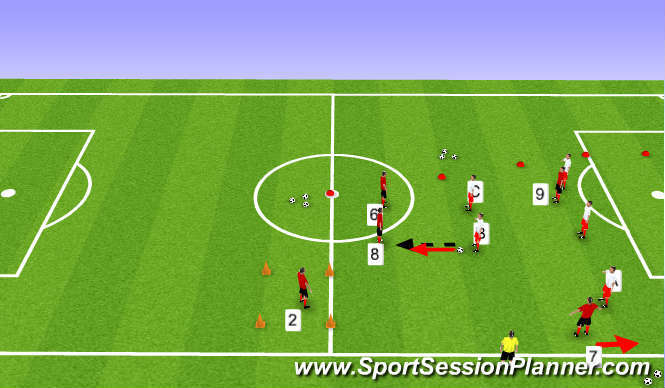 Player &apos;7&apos; can look to take first touch inside and explode past the back line by dribbling into the box. 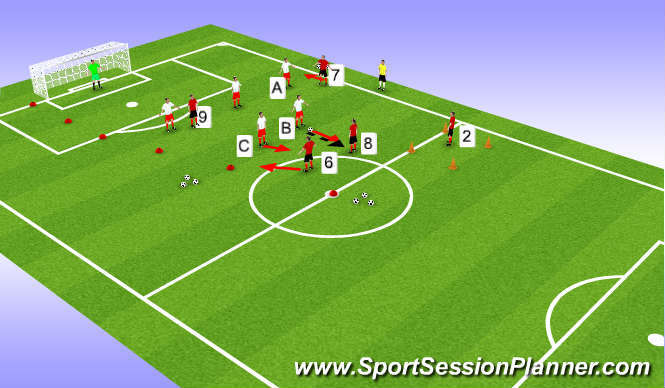 Player &apos;7&apos; can look to take first touch inside and play a penetrating pass for Player &apos;9&apos; into the box. Player &apos;7&apos; can look to take first touch outside and past the FB and dribble into the box or cross it. As above Player &apos;7&apos; can take first touch inside and combine with Player &apos;9&apos; who comes to show for the ball on Player &apos;7&apos;s first touch or when s/he gets his/her head up for a wall pass between the FB/CB channel. 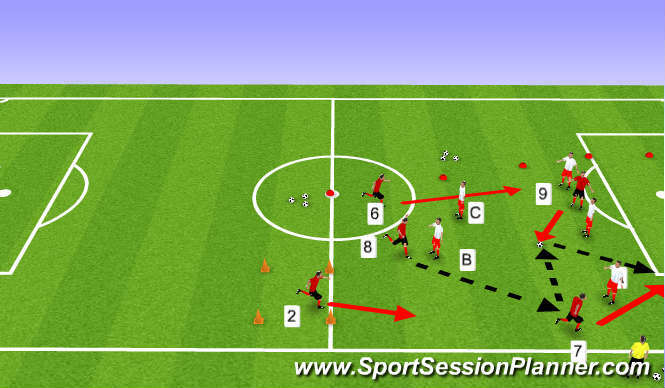 As a licensed coach who and how can Player &apos;7&apos; combine with to get in behind the FB.